I've been struggling a bit lately to find time for the horses, so Rondo has been progressing somewhat slowly, but progressing he is. We've been working on ground driving to teach him about bit pressure and what it means. The first time we did it in the big outdoor arena, and he did fantastic, only to lose his mind (an adolescent moment, as another boarder called it) when we went to take off the bridle. 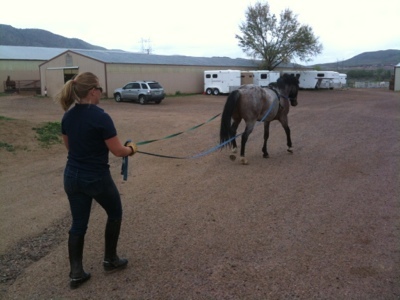 This past week, he was behaving himself a little better with the bridle, so we ground drove him around the property. This provided its own set of challenges, as there were a lot of distractions that he had to learn to ignore: a horse turned out in the arena, a mini in the round pen, horses in the turnout pens behind the barn, an unfamiliar wide-open field, and lots of grass to eat. As my trainer said, it was a crash course in maturity. I was pleased that he started figuring out how to work in the face of distractions after only a few laps around the outdoor track. Rondo actually turned 3 on April 16th, although I (sadly) did not have a chance to celebrate it. My birthday was last Thursday, and I nearly didn't have a chance to celebrate that either, as my mother-in-law went into the hospital that day. (She passed out at work and hit her head, and was diagnosed with a concussion and emphysema.) Michael and I went out for a late dinner after leaving the hospital, but my birthday ride had to wait until Friday evening. I have other news and things to blog about, but hopefully I'll be able to start posting with some regularity now!